Taste of Melbourne kicked-off on Thursday, 15 September. It goes on until 18 September (Sunday) and is being held at the Royal Exhibition Building in Carlton. Such a pretty venue! With Rachel's trained bargain-hunting eye on Groupon, we had managed to secure 2-for-1 tickets so entry was only $12.50 as opposed to the full price of $25 ($30 if you buy your ticket at the door). Win! Had to buy some 'Crowns' to spend on food inside the place. 1 Crown = $1. I personally think it's a bit of a waste of paper, and a bit mean because you might have extra Crowns left over and nothing to use them on. But it's probably done this way so that the organisers can keep track of the sales and performance of each participant in the Festival. That's my guess.. It was a Friday night that we went - 16 September, between 6pm and 9:30pm. The whole place was packed! And there were many booths that were serving cocktails and other alcoholic beverages, so there were a few tipsy people stumbling around. But overall, still a fairly maneuverable place - with sufficient dining space to sit down and consume our food purchases. 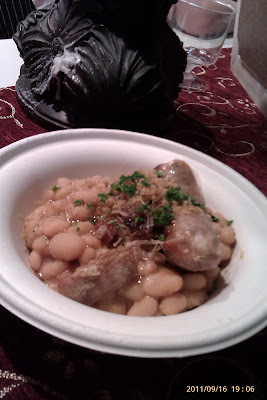 Overall, the food was of fairly well-prepared in terms of taste and presentation - some were better than others, but given that the restaurants in the festival had to cater for the masses, it was a pretty good compromise between mass-production and quality. We started off with food from The Millswyn. Rachel had the 10hr braised beef cheeks with beetroot, spinach & field mushrooms (12 Crowns). Rachel said it was a bit weird eating beef at room temperature - but she did think it was tasty. Chris had the Cured Regal King Salmon with pickled daikon, lime and vanilla cucumber (10 Crowns). 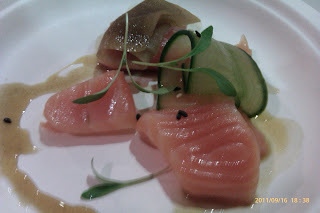 It was very tasty, fresh salmon, lovely delicate flavour from the curing, and the dressing and pickled daikon went well with it - Chris really enjoyed it. I got the dessert - Peanut butter parfait sandwich with raspberry jelly (8 Crowns). It was very tasty, albeit small in portion size. It was served with raspberry jelly and salted caramel paste on top of it. The flavour and texture balance was definitely there sweet with salty with tangy, soft with crunchy. We had all this while sipping mojitos! Rachel thought it was a bit strong, but I waited for the ice in mine to melt a little so when I drank it, it tasted pretty good to me. She did however come back with more Crowns, and food from the Esposito & St Peter's booth - Fondant de chocolate with Earl Grey jelly (8 Crowns) and Carpaccio of farmed Barramundi with peas, mint & wasabi sorbet (10 Crowns). Chris and I tried some of it the fondant. Sooooo yummy! 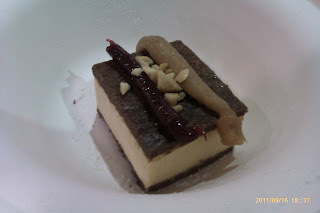 The fondant wasn't really a fondant, more like a very dense version of a dark chocolate mousse. But that combination of rich, smooth chocolate, Earl Grey jelly, and clotted cream was divine. I had to refrain from eating the whole thing before Rachel did! Rachel said her carpaccio was good - I tried some and agreed. After we wandered around more, sampled a few random things from the stalls, Rachel and Chris decided to try the Botanical wagyu beef burger (12 Crowns). 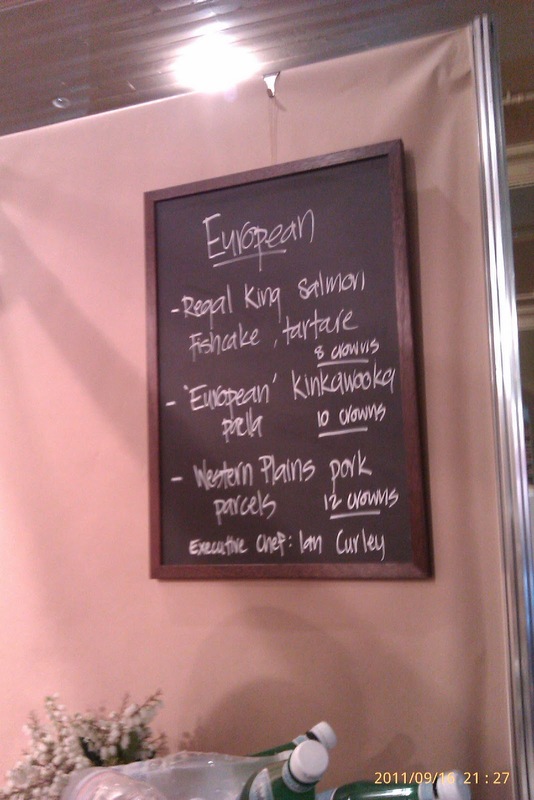 I had the Turkish lamb dumplings, garlic yoghurt, sumac and dried fruit (10 Crowns) from St Katherine's. I was lucky enough to have my order taken by none other than Shane Delia!! Too shy to ask for a photo, I left to join Rachel and Chris, still slightly star-struck :p The wagyu beef burger was apparently not as good as expected - tasty, but I think Rachel and Chris had expected more. My lamb dumplings kinda grew on me. The first bite was a little confusing - I wasn't used to discovering the stringy texture of lamb within a dumpling. 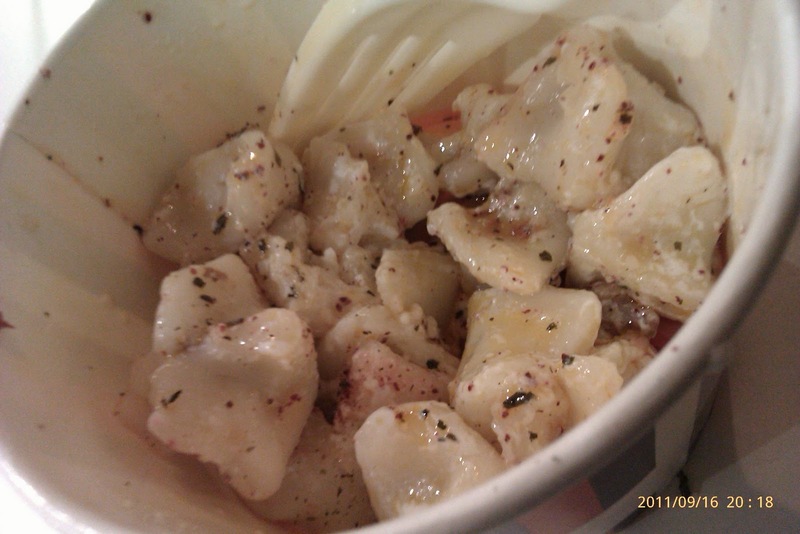 These dumplings were made with pasta skin, rather than the Chinese-style dumpling skin. But as I ate more of it, the dish grew on me - the yoghurt was a good complement to the dumplings, and the sumac added just the right amount of spice as well. In the end, I decided that I actually really liked that dish. Oh and I also liked that the dumplings were bite-sized. So cute! 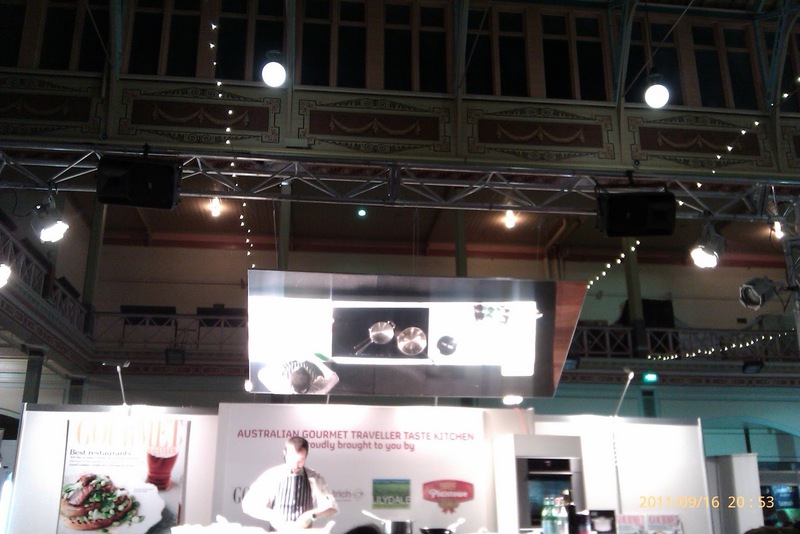 Cooking demo - bad photo... sorry! Overall, we left the festival with our stomach filled to bursting point, happy with our taste trials and purchases (Chris bought some tea, and I bought a tub of ice cream :p). I'd recommend the Taste of Melbourne to anyone with a love of good food. Wish we'd had more time to try more things!!! +39 (+30 minutes) = ?